Will South Africa smash the African medal tally at Rio? The South African Olympic team travelling to take on the world in Brazil this August is capable of returning home with the title of best African ranked nation in the medal standings. A total of 137 athletes will descend on Rio for the 2016 Olympic Games, representing South Africa with the biggest contingent in the country’s history. The size of the team is not what is important, however, as the capabilities and potential of the athletes who have managed to qualify is what stands out in a team that boasts numerous world class sportsmen and women. At the London Olympics four years ago South Africa earned six medals; three gold, two silver and one bronze, allowing the country to place 23rd in the overall medal table. The South African team can count on a selection of stars who look destined to become Olympic medallists. Ethiopia managed to return from the English capital with three gold, one silver and three bronze, while Kenya achieved two gold, four silver and five bronze medals. While the two East African nations earned more medals overall, Team SA achieved as many gold as Ethiopia, with one more silver medal tipping the scales in their favour by the narrowest of margins. The doping scandal that has rocked both Kenyan and Ethiopian athletics will likely dampen the resolve of their athletes in Rio, and the teams that they are sending are simply not as competitive on as many levels as their southern African counterparts. At the upcoming Olympics, it is not difficult to predict which African nation will rise to the top in both quantity and quality of medals earned, as the South African team can count on a selection of stars who look destined to become Olympic medallists. Not to mention the other athletes who will spring a surprise or two come their events. 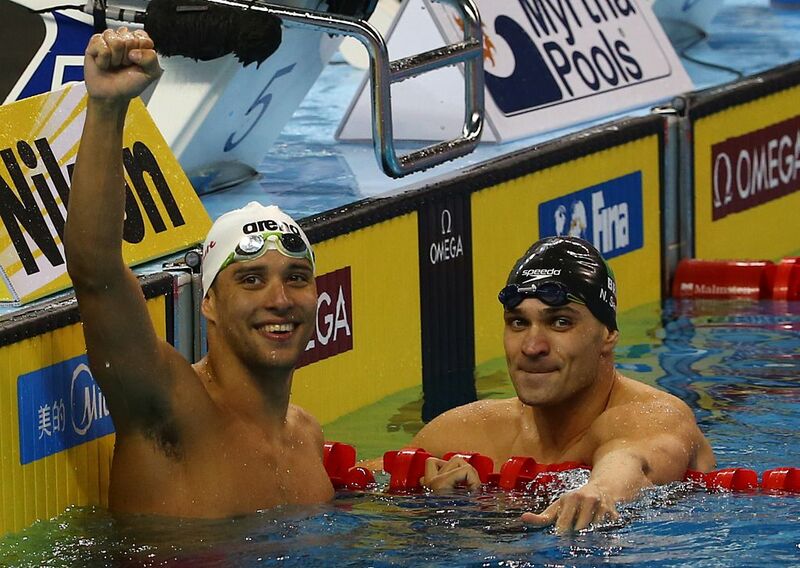 A discipline that traditionally favours South Africa with a likely medal or two is swimming, with former stars Penny Heyns and Ryk Neethling coming to mind. This year is no different, as the likes of Chad Le Clos and Cameron van der Burgh aim to repeat the medal feats from London 2012 which saw them thrust into the limelight. Van der Burgh’s speciality breaststroke will no doubt see him competing for medals in one or two swimming events, while golden boy Le Clos will be the man to beat in the butterfly 200m, 100m and 50m events, as he comes up against his nemesis and Olympic medal record-holder Michael Phelps. With 22 medals in four Olympic Games appearances, this will be Phelps’ swansong, but Le Clos could spoil his fun. Out of the 137 individuals from South Africa who will call Brazil home over the coming weeks, 39 will compete in the athletics discipline. This is one of the most impressive groups of athletes ever to feature for the country, and there will certainly be a number of medals placed around the necks of South Africa’s track and field contingent. The women’s 800m gold medal is Caster Semenya’s to lose. Her efforts in the lead up to these Games have been astonishing. She broke her seven-year-old 800m record by 0.12 seconds at a Diamond League meeting in Monaco recently, and she has dominated her favourite race throughout the season. Good news for South African fans is the fact that Semenya has decided to attempt the 400m – 800m double, qualifying for the one-lap race and looking to secure a medal in that particular distance too. It would be a surprise not to see a couple of medals, and at least a gold come from the 25 year old. Wayde van Niekerk, the current 400m record holder and South African flag bearer will be a tough man to beat in a race that he has made his own in the last few years. He is the only athlete ever to run the 100m under 10 seconds, the 200m under 20 seconds and the 400m in under 44 seconds. While 100m sprinter Akani Simbine will find it difficult to out-sprint Usain Bolt in the men’s final, his recent performance in which he earned a new South African record while edging in front of Jamaica’s Asafa Powell will certainly give him confidence. Carina Horn will also be aiming to turn a few heads in the women’s 100m with her blistering pace. Dominique Scott is another surprise package, as the 23-year-old long distance athlete recently won races in the US with a 10,000m time of 32:35.69, and a 5,000m time of 15:57.07, putting her firmly in contention for those events. Javelin champion Sunette Viljoen came fourth at the 2012 Olympics in London, and she will be looking to go one better in Rio to add to her gold medals in the Commonwealth Games and African Championships. South Africa’s famed Rugby Sevens team, the Blitzboks are also on track to feature on the podium in the men’s competition, following the squad’s excellent season in which they finished second to Fiji overall. Team SA is aiming to win 10 medals in Rio, which would represent the country’s best medal haul since re-admission to international sport in 1992. With sevens rugby introduced at the Olympics for the first time this year, South Africa will look to earn at least a silver medal during the tournament, with the ultimate goal of gold certainly not out of the question. Canoeing star Bridgitte Hartley is aiming for gold in the women’s 500m sprint canoeing event, having won the bronze at London 2012. A selection of strong rowing teams will also represent South Africa in Rio, and there could certainly be a medal in waiting amongst those teams, as was the case in London four years ago when an unfancied lightweight men’s rowing four stunned their opponents to win gold. Team SA is aiming to win 10 medals in Rio, which would represent the country’s best medal haul since re-admission to international sport in 1992, while it would equal South Africa’s best ever medal tally, which dates back to the Antwerp 1920 and Helsinki 1952 Olympics. The long list of potential champions and podium finishers targeting glory in Rio bodes well for Team SA, which will almost certainly top the medal table from an African perspective, and may even sneak into the top 20 overall.